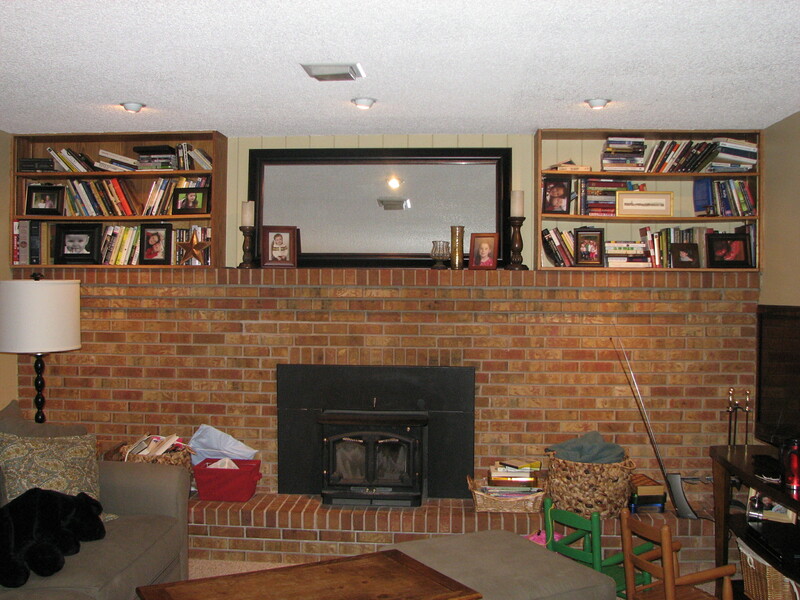 It’s been nearly a year since my post on my painted brick fireplace. From my traffic, I can tell that many of you are just like I was before I painted my brick fireplace, searching the Internet to find the best, most affordable way to spruce up some dingy brick. You can do this. You can paint over your brick. It is time consuming. It took me nearly two full weekend days, but it is not hard. And it was so worth it. If I had done more prep work before I started on Saturday morning, it would have cut a few hours off my time. Part of our project was removing the wood-burning stove insert out of our fireplace. This part actually was kind of hard and time consuming, because it was so dang heavy. But I’m guessing many of you can skip right over this stage. So on to the painting. Step 1: Vacuum your fireplace. Not the inside, just the outside and the top. I took my brush attachment and vacuumed any dust and debris that had settled into the cracks and the tops of the bricks. This didn’t take long. Step 2: Clean the surface. I washed down my brick with soap and warm water. You don’t want to get it too wet, just cleaned up so your paint doesn’t get dirty from fine fireplace soot. Step 3: Tape off anywhere you don’t want paint. I put painter’s tape on the walls surrounding the fireplace. If you have permanent glass doors around your fireplace, tape them off too. I could have done all of these steps the evening before I started. I didn’t begin to prime until the early afternoon. Step 4: Begin to apply primer with a thick, 1″ nap roller. I used Kilz, and my large fireplace took over half a gallon. Your arm will be incredibly sore after this project because after a while wielding a thick-nap roller filled with paint gets heavy. But, again, it’s worth it. Step 5: Take a cheap brush and jab the primer into the cracks and crevices of the brick. If you have good quality brushes, you might want to buy a cheap one just for this project. You’ll need bristles, so don’t get foam. But jabbing into brick will just about ruin your brush. Step 6: Caulk any large cracks that aren’t filled with primer. I waited until the end to do this, but next time I’d do it sooner. It’ll save you time from having to jab paint into the really deep cracks. Step 7: Begin to roll your paint. I used Behr’s interior latex flat paint in the same custom-match shade as my walls. I went with a flat paint to minimize the look of the texture. I’m sure eggshell would be fine too. The color I used is similar to Swiss Coffee by Behr. I thought a lot about painting my fireplace something other than white. But as I looked around, all of my favorite painted fireplaces were white. So I went with it. In the picture below, the top paint is the primer, and the color below is the paint color. Step 7 cont’d: Roll your paint again, and maybe again. I think it took me three coats of paint. The front of the bricks were easily done in two coats. Getting the mortar covered took the third coat. At this point I used a foam roller and just went over the mortar joints again. Painting brick is a little like painting a sponge. It just soaks up paint. I used two-thirds of a gallon of paint on just one half wall. That’s a lot of paint for a small surface. I didn’t paint the surfaces of the bricks that wrap around the fireplace opening. They are stained black by all the soot, so they look okay left alone. And since I wasn’t using heat resistant paint, I didn’t want to create a fire hazard. If you have fireplace doors, this part will be covered anyway. That’s it. If you prep, prime, and caulk day one, you can wake up and start painting day two. We were all cleaned up and prepping for the week by late afternoon on Sunday.